Check out the latest in bus shelter design & enter our "Selfie Station" contest! Join us on Monday, October 9th, 2:15pm in the Innovations Learning Zone (Hall B, Booth 4161) as we present, "Reliable Solar Power Solutions for Stops and Stations to Help Grow Transit Ridership." Stop by our Booth #3203 anytime during the EXPO in Atlanta to rest your feet and take shelter. Be sure to grab a selfie in our specially designed "Selfie Station" and post it to social media to be entered to WIN* a prize! Tolar Manufacturing Company announced on August 8, 2017 that it has completed the delivery of 16 bus rapid transit (BRT) stations and an additional 10 bus stop shelters for Santa Clara Valley Transportation Authority (VTA) in San Jose, California. 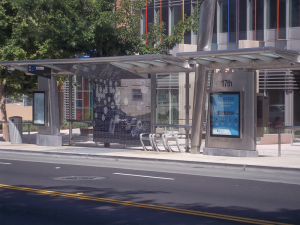 The shelters are now installed along VTA’s new and exciting seven-mile Alum Rock-Santa Clara Bus Rapid Transit corridor and throughout the city’s downtown core. The 47-ft to 51-ft purpose-built BRT shelters reflect the character of the surrounding business corridor with stylishly modern sleek lines, brushed stainless steel cladding and rail barriers. Weather protective walls and beautiful angled glass roofs incorporate lively public art elements that extend through to the ground. State-of-the-art amenities include real-time information in oversized LED digital displays, closed-circuit 24/7 security cameras, enhanced under-roof passenger security lighting, and light poles equipped with LED next bus arrival readers. Four of the seventeen BRT shelters are built directly on the boulevard median adding to the complexity of the project. Tolar Manufacturing also fabricated ten, 12-ft to 19-ft bus stop shelters designed to tie-in with the BRT station look and feel creating a cohesive image for VTA. 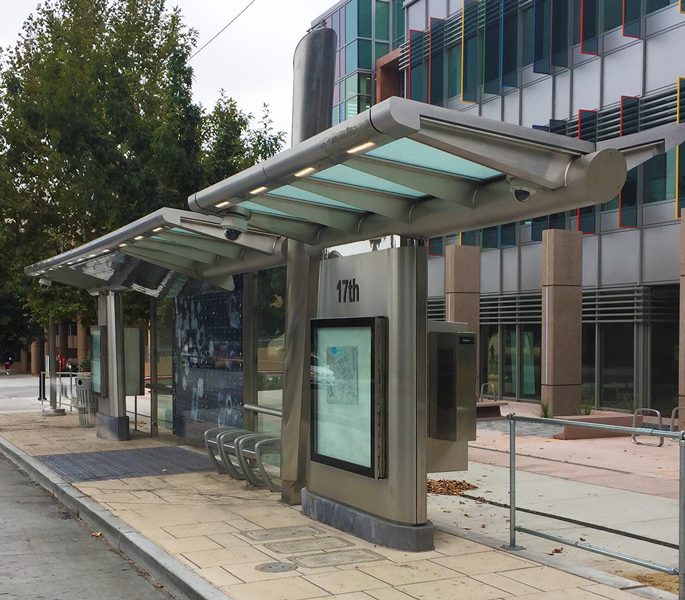 These free-standing bus stop shelters incorporate angled polycarbonate roof panels, aluminum support poles, seating, and security cameras. Some of the stops also include oversized transit information displays. Tolar Manufacturing Company announced in January that it has supplied custom art glass panels for 15 bus shelters that the company previous built for the City of Gainesville, Georgia. 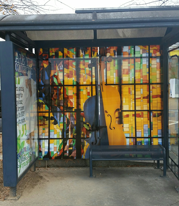 The Bus Shelter Art Project is a partnership between the City, Vision 2030 of the Greater Hall Chamber of Commerce, and Quinlan Visual Arts Center and was funded with a U.S. Section 5307 capital grant. The art glass panels feature works from local artists selected by the Vision 2030 Public Arts Committee from among over 81 entries. Using digital printing technology, Tolar Manufacturing reproduced the artist’s works in exacting detail onto 44” x 79” custom glass panels that were then installed on-site by the City onto the backs of each shelter. “The high quality production process we use ensures that these pieces will last for years at the bus shelters through out Gainesville,” stated Scott Williams, Business Development Manager for Tolar Manufacturing. Included among the 15 pieces of art chosen for the project is, 57 Chevy by Travis Massey, Musical Vision by Larry Griffeth, Morning Sail by Anne Brodie Hill and Gainesville by 18 year old Edgar Esquival. The high visibility bus shelters are strategically located through out the City’s busiest centers. Tolar Manufacturing Company and Streamline Integrated Solutions (SIS) announced in August 2016 that the companies have entered into a joint venture to create and develop digital information solutions for the transit shelter and outdoor advertising display market. This strategic partnership pairs SIS’ world class design and cutting edge engineering team with Tolar Manufacturing’s 25 years of award-winning experience as the industry leader in the production of transit street furniture and shelters as well as the lifestyle center industry, which includes shopping malls and airports. This partnership comes at a time when transit agency surveys show that providing timely and accurate information at stops is key to boosting rider confidence. Delivering accurate, real-time information either at the stop or on the rider’s mobile device is quickly becoming the norm. Tolar Manufacturing and SIS are leading the way in developing distinctive technological solutions that address growing consumer expectations. “Combining the multi-disciplinary talents of the SIS engineering and software development team with the vast design and manufacturing capabilities of our team here at Tolar will result in cost-effective fully-integrated digital media solutions for our clients,” stated Gary Tolar, President and Founder of Tolar Manufacturing. The companies combined early projects include the development of up-to-the-minute digital passenger information and digital advertising displays for multiple BRT (bus rapid transit) projects with major east and west coast public transportation agencies. “Tolar and SIS share a common end goal of creating complete digital media solutions for their customers. This partnership will allow both firms to fully implement and realize those goals with solutions that will change the digital media market as we know it,” stated Nick Lee, President and Founder of Streamline Integrated Solutions. 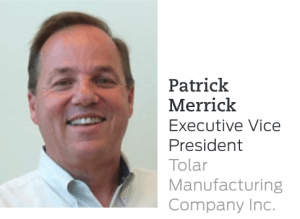 In the current June issue of Mass Transit Magazine, Patrick Merrick, Tolar Manufacturing Company EVP provides insights into Tolar’s best practices with real-time information at bus stops and transit shelters. He discusses Tolar Manufacturing’s new alliance with Streamline Integrated Solutions. “This strategic partnership pairs SIS’ world class design and forward-thinking engineering team with Tolar Manufacturing’s 25 years of award-winning experience as the industry leader in the production of all-weather transit displays, kiosks and shelters.” Refer to page 40 of the magazine for the full article and learn how Tolar is leading the way in developing distinctive at-stop technological solutions that address growing passengers expectations. Refer to page 40 of the magazine for the full article and learn how Tolar is leading the way in developing distinctive at-stop technological solutions that address growing passengers expectations. Click here to read full article (see page 40). In May 2017, Tolar Manufacturing Company announced a relaunch of their company website. The new site makes it easy for viewers to stroll through the company’s many diverse product lines from transit shelters to BRT stops to SmartPlace™ shelters, street furniture, solar solutions and displays for public transit, lifestyle centers and airports. “We’re particularly excited about our Projects of Distinction section of the website,” stated Patrick Merrick, Tolar EVP. 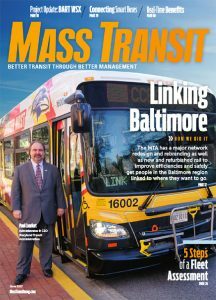 “It’s a great way to showcase the many unique projects we’ve designed and fabricated for public transit agencies and municipalities across the country. They really evoke a ‘Sense of Place™’ within their communities.” Users can choose to peruse all of the Projects of Distinction or drill down to those in their city and/or state. Tolar clients even have the option to upload their Tolar-built projects for consideration to be showcased. The site was designed and developed by Noble Image with copywriting, art direction and project management provided by Coverly Professional Services. Located in beautiful Atlanta, our host city for APTA EXPO 2017, this 10-ft transit shelter features a radius roof, flat back-to-back advertising kiosk, dual map cases, escutcheon shoe covers, LED lighting, and aluminum framed recycled slat bench. It is also available with a perforated wall option. THis 13-foot Signature Rosebridge angled flat roof transit shelter located in Portland, Oregon includes grey laminated glass roof panels, clear glass walls, integrated bench, and angled support posts opposite the flat back-to-back media display kiosk that contains two 75” LCD monitors in a NEMA-rated enclosure. This 48-foot Signature BRT stainless steel transit shelter for Santa Clara Valley Transportation Authority (VTA) in San Jose, California is one of our latest SmartPlace™ projects that truly reflects the character of the surrounding business corridor. The stylishly modern sleek lines incorporate brushed stainless steel cladding and rail barriers, weather protective walls and beautifully angled roof. Lively public art elements adorn the walls and extend through to the surrounding pavement. State-of-the-art amenities include real-time information in oversized LED digital displays, closed-circuit 24/7 security cameras, enhanced under-roof passenger security lighting, and light poles equipped with LED next bus arrival readers. Tolar Manufacturing purpose built 16 BRT stations for VTA and an additional 10 bus stop shelters that tie-in with the look and feel of the BRT stations and can be found along VTA's new and exciting Alum Rock-Santa Clara Bus Rapid Transit corridor. This 13-foot Signature series advertising shelter is part of a larger, multi-year, 600 shelter and 1,800 bench project for San Diego Metropolitan Transit System. The shelters and benches will be creating a Sense of Place™ for many communities within the MTS service. The custom-designed shelters are based on Tolar's popular Signature Sunset series and feature agency branding, dusk-to-dawn solar illumination, weather and sun protective roofs, perforated metal walls, damage-resistant seating, pole-mounted trash/recycle receptacles, large easy-to-read transit information displays and architectural accent strips. Importantly, the flat back-to-back revenue-generating advertising display kiosks help support the cost of this project. This 26-foot Niagara enhanced bus advertising SmartPlace™ transit shelter was built for Dallas Area Rapid Transit (DART) and features opaque monolithic roof panels, perforated metal walls, and slat benches with back. The dome-roof shelter also features 600 watts of solar to power roof safety lighting, a back-to-back LED illuminated advertising display kiosk, two line real-time signage, security camera and data communication. Interestingly, the solar is designed with an integrated roof fixture that houses the batters energy management system (EMS) and data communications. The system design includes 7 days of autonomy to allow for periods of inclement weather. This enhanced approach to technology also allows for monitoring of the EMS remotely to monitor system performance.